Use a knife to gradually shave off the side corners of the foam. You want it to fit very snugly in the bucket and touch the bottom. It will be wider at the top than the bottom. Shave a little at a time and then check how it fits in the bucket. To create a hole in the center, push the blades of a closed pair of large scissors straight down into the center of the foam. Gently twist them around to create a hole. Press a wooden spoon into the opening – go all the way down to the bottom. Open the handkerchief and iron it flat. Put the bottom stem of the flowers in the center of the handkerchief. 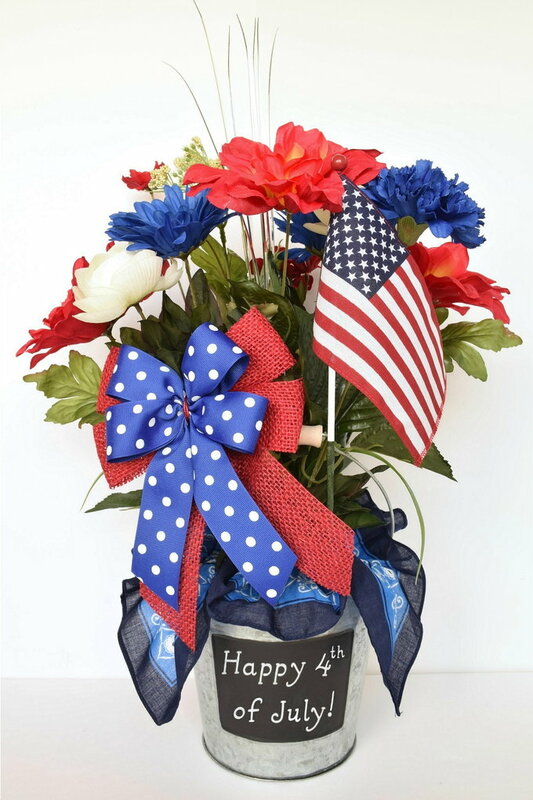 Wrap the handkerchief up around the base of the flowers. Hold it tightly in one hand up close to the flowers. The four corners stick out too much so pull on the lower handkerchief fabric so that less of the corners are sticking out. At this point it’s better to have more of the handkerchief held in than out. Wrap a rubber band tightly around it where you’ve been holding it. Press the flower stem straight down into the center of the foam until it touches the bottom. You may need to twist the handkerchief around the stem because it is bulky. You may also have to shave the inside hole a little bigger with the closed scissors. Situate the handkerchief corners and edges around the top of the foam so the foam is covered and it goes over the edges of the bucket. You may have to take it in and out of the foam to readjust it. Two of the corners of the handkerchief should fall to the sides of the chalkboard, not in front. Check that any tags or printing on the handkerchief is situated at the back. The wooden handle should be in the front. 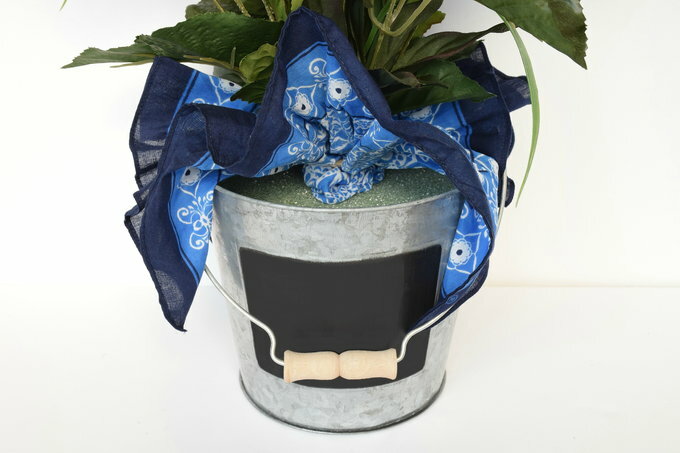 If you’ll need rocks to hold it down for an outdoor event add them now and check to see that the handkerchief still covers them and over the edges of the bucket. 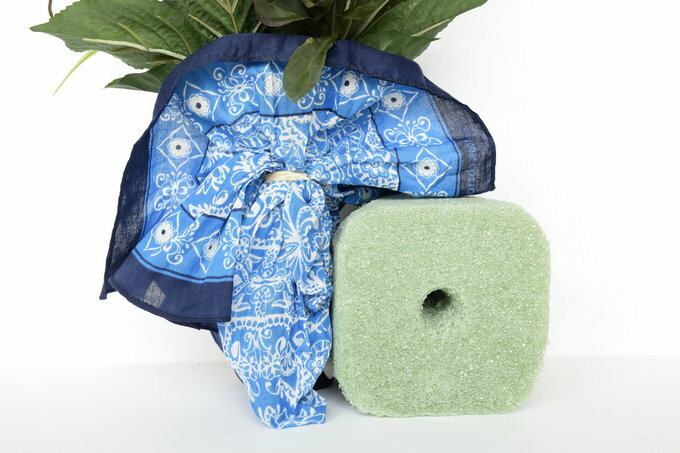 Once you’re sure the handkerchief is covering the foam just right, take everything out of the bucket. Put hot glue in the bottom of the bucket and press in the foam. Bend the flowers out some and position them as you would like. Leaves can be moved up and down. 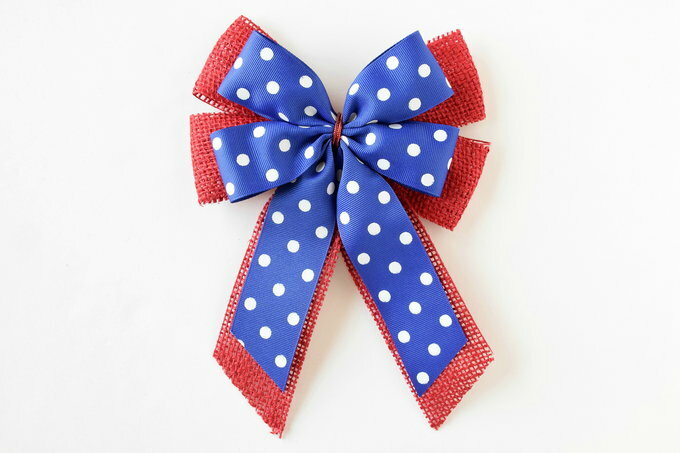 You’ll make your blue ribbon just like the red burlap ribbon is made but smaller. Cut the blue ribbon into three strips that are 15” long. Roll two of the ribbons into loops 5½” long. In the center of each loop pinch them together like a folded fan. Do the same with the lower strip. Tightly hold all three pieces pinched together. 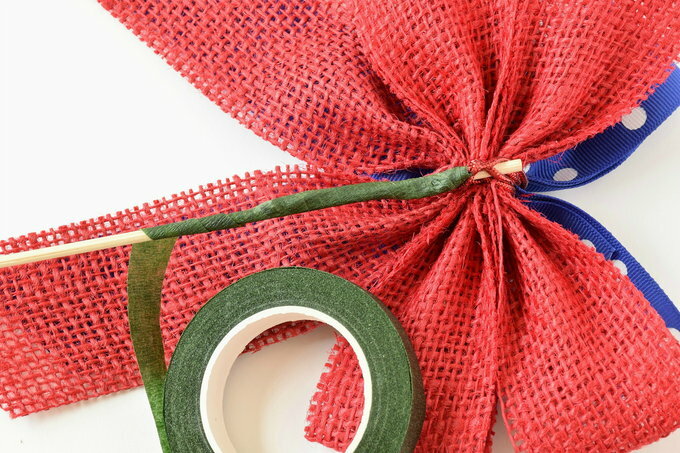 Use the red metallic tie from the burlap bow to wrap it around where you’re pinching the three pieces together. One end of the tie came from the top and one from the bottom. I twisted them together in the back. Trim the ends of the lower strip at a diagonal so that they end short of the red ones. Carefully dab tacky glue along the raw edges so they don’t fray. Let them dry. Slide a wooden skewer through the tightly wound red tie on the back of the bow. The top of the skewer should barely stick up above the red bow and not be seen from the front. Wrap the tail of the tie around the skewer. Cover over the entire skewer with floral tape by wrapping and turning. The floral tape becomes sticky and adhesive when it’s stretched. 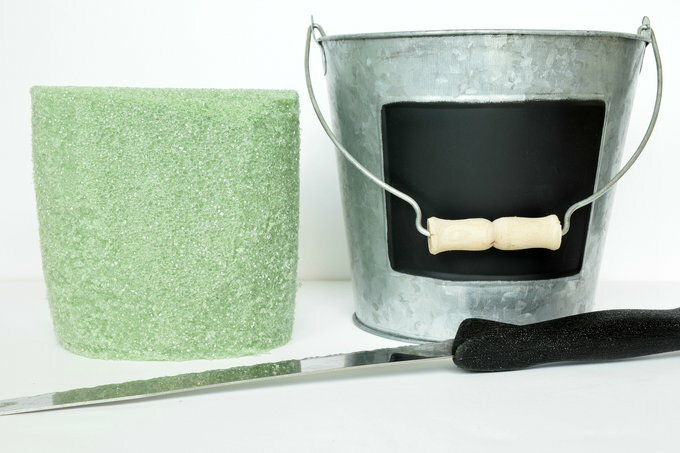 With the wooden bucket handle up, insert the skewer in the foam on the left side. I did not go through the handkerchief. After it was in the foam, I laid the handkerchief closely around it. 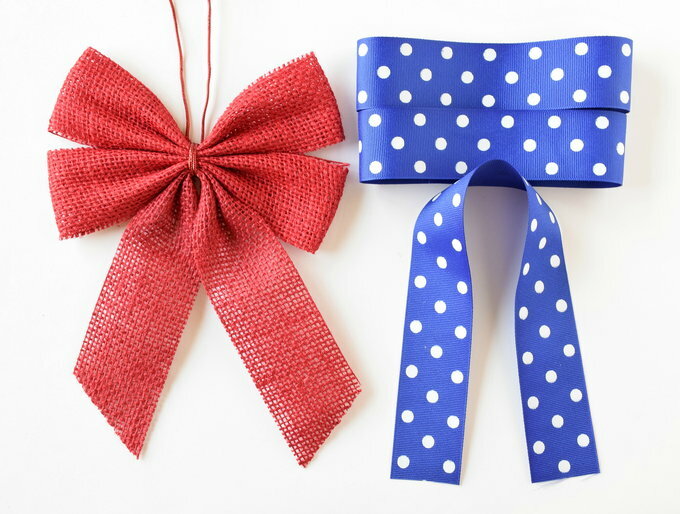 Puff up the edges of the burlap bows and the loops on the blue bow. You want them to look 3D not flat. Align the flag with a wood skewer so that the skewer is beside the lower half of the flag pole. 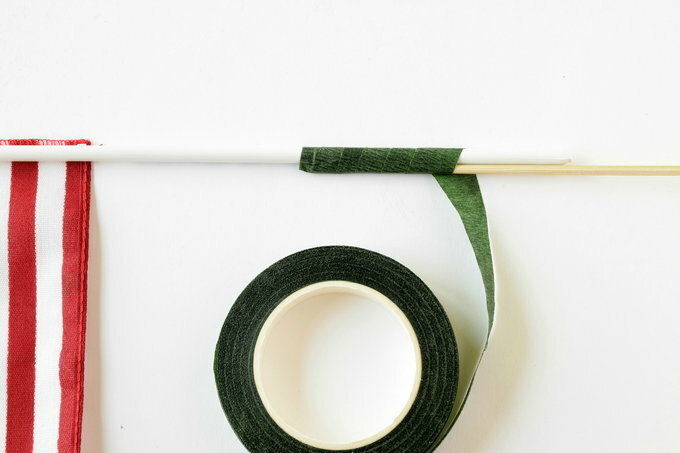 Wrap floral tape around both sticks where they overlap and all the way down the skewer. Insert the flag in the foam the same way you did with the bow but on the right side. The flag should sit higher than the bow. 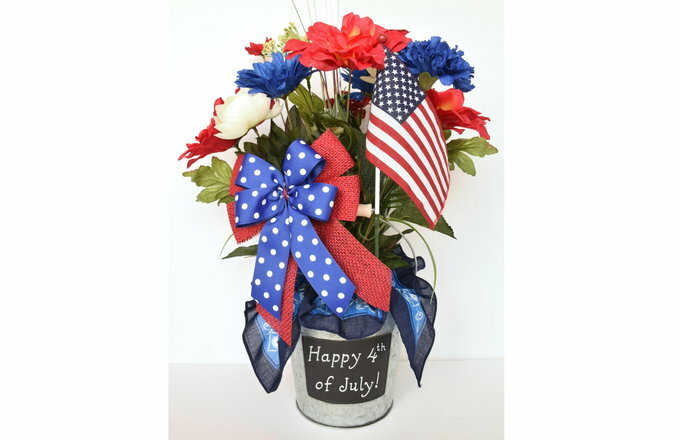 Write a patriotic message on the pail with the chalk. If you make a mistake, it is easily wiped off with a wet cotton swab or sponge. You may want to look for a cute font to copy.